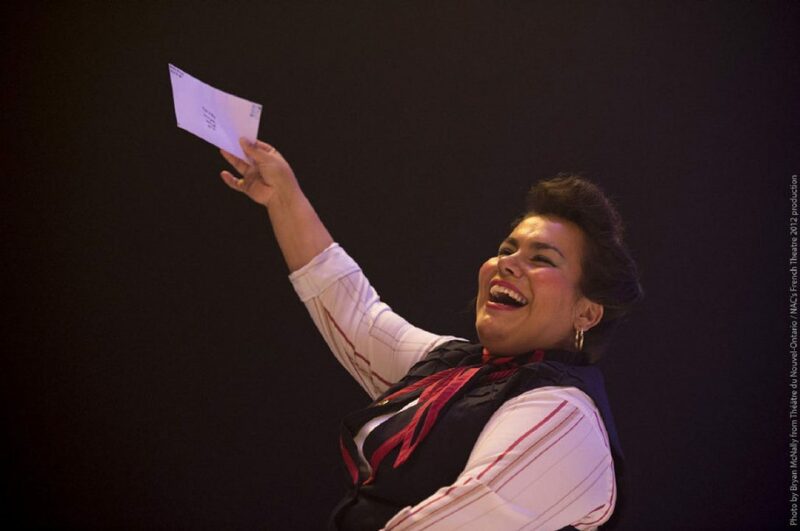 Patricia Cano slays Tomson Highway’s latest work, a cabaret-play hybrid that charts a typical afternoon in the life of a Métis post office worker in Northern Ontario. Featuring a full soundtrack’s worth of songs composed and played live onstage by himself on piano and Marcus Ali on saxophone, and sung entirely by Cano, The (Post) Mistress is a loving, slightly over-indulgent piece that gains increasing emotional and musical energy as it goes on. Having originally written the music for a cabaret show, Highway has since crafted a narrative (more of a concept) to surround the songs, all of which essentially act as an excuse to put Cano centre-stage as the titular post-mistress Marie-Louise Painchaud, and make use of her glorious musical and performative talents. That’s a little disingenuous: the play itself, via Cano’s titular post-mistress, offers glimpses into the loves and losses of various figures, all of which make up a patchwork of Canadiana. As my viewing companion for the evening commented, Highway’s work is a kind of celebration of the Canadian linguistic and emotional landscape. The first two weeks of this Toronto iteration were performed predominantly in French, with the last two weeks being performed mostly in English (at the time of writing the show is well into the first of these final two weeks). But each performance presents a range of languages: songs are sung in French, English and Cree (with subtitles projected onto a screen at the top of the stage, though interestingly a Cree song which appears early on in the evening is left untranslated for non-speakers, its emotion and the aural specificity of the language being allowed to take over for those like me who couldn’t understand the words). The resulting 2 and 1/4 hour show brings us into the imaginative and quietly tragic world of Painchaud, the first ever post-mistress in the fictional town of Loving, Ontario, “just a couple of miles away from Complexity, Ontario”. The Berkeley Street Theatre upstairs space has been outfitted by designer Teresa Przybylski as a post office, with a stage-high mail shelf, from which Cano’s Marie-Louise retrieves various letters that pass through. Just about every piece of mail she reads is a love note of some kind (“Anyone who’s in love is my friend,” she says at one point), and each presents an opportunity for another song. They run the gamut from wistful ode to mourning missive to braggy letter detailing a friend’s intense and sexually adventurous trip to Buenos Ares, a highlight of the night that Cano performs with glorious gusto, belting and leaping around the stage, dancing herself via Marie-Josée Chartier’s choreography into an exhausted frenzy. Indeed Cano’s entire performance is a passionate and charismatic triumph, particularly as the play kicks into gear in the second half with songs that cover more of a tonal range, along with a final twist which is less shocking than it is explanatory, tying the show up in a slightly pat but endearing way. Highway writes in the program notes that a particular Ancient Greek figure served as a partial inspiration for the play, but to reveal which one would give away the nature of this climactic revelation. Suffice to say that while it offers an effective conclusion to the evening, as the story’s only real plot turn it underlines the play’s structural slightness: while director John Van Burek keeps things moving along nicely, staging dynamically paced show, the piece feels a little stretched, and might make more sense as an intermission-less 90 minute-ish show (the somewhat repetitive first act could be cut down). And anyways, none of this should take away from the loveliness of Highway’s songs, and the accomplished but comfortably low-key onstage musical accompaniment of himself and Ali, who play off each other and Cano with practiced ease (with Ali getting to play a kind of saxophone-playing tempter in one song, to fun effect). And it certainly shouldn’t take away from Cano herself, who is a powerhouse. Dressed in clothes that suggest postal worker but which scream air stewardess, her Marie-Louise is clearly thrilled to have an audience, and when she isn’t belting out tunes she’s relaying even more personal stories and the stories of others she has known with a warm chattiness that nicely bridges the many songs. She has a fabulously expressive singing voice that at certain points reminded me of Nina Simone in their assertive plaintiveness, as if the notes she hits were bemused by themselves even while still nailing their target. She also manages to overcome some of the acoustic issues of the space, which don’t seem ideal for music (though I was sitting in the very back row, several steps up from the stage). Easily switching between French, English and Cree, while dominating the stage for over two hours with a layered performance, Cano presents herself as a force to be reckoned with. She should probably be a superstar.